The staff collecting funds and the Principal withdrawing money from General Provident Fund (GPF) to buy blazers for all students in their school sounds incredible but it is true. 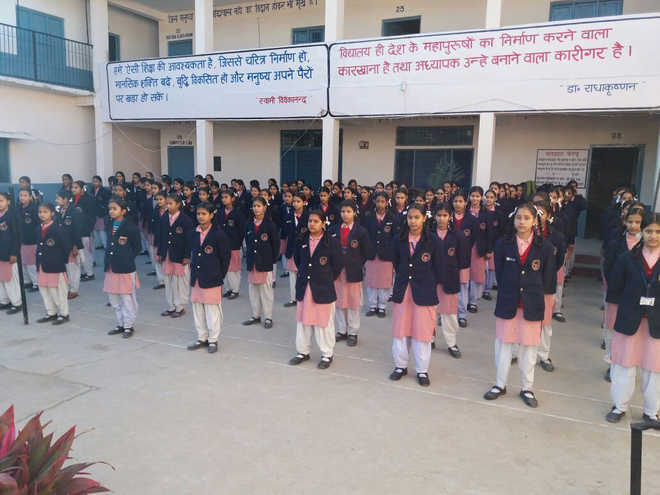 All 464 students of Government Model Senior Secondary School, Dhundan in Arki subdivision of Solan district, about 45 km from here, are enjoying the warmth of blazers in harsh winters, thanks to the novel initiative of the Principal as well as the staff. “The people of the area are poor, struggling hard to earn their livelihood under tough conditions and not all of them can afford to buy blazers for their children. When I shared my feelings with the staff, they were not only supportive but also collected Rs 1.43 lakh while the remaining amount of Rs 2 lakh was contributed by me,” says publicity shy Principal Sartaj Singh Rathore. Nostalgic about his childhood memories when there was no proper buildings of the schools and students used sit on the ground, he gives the credit of his satisfying journey from a village boy to the Principal of the same school. “I have studied in this school from standard VI to X and wanted to express my gratitude and this humble effort was the beginning and, therefore, I withdrew Rs 2 lakh from the GPF to distribute blazers to all students,” says the national awardee teacher. To lay more emphasis on education, Rathore, who was transferred from Sirmaur to his school in October 2016, persuaded all teachers to teach students for an extra hour which paid dividends and, for the first time, a boy from the school topped the commerce stream. This year again, the annual day will be celebrated and the staff, including the non teaching and Class IV employees, and students will wear the same dress, coat and tie. The calendar of activities to improve teaching-learning and other co-curricular activities will be prepared after the annual day and the quest for doing more for the school and children will continue, he adds. This school has become a model for other schools to emulate and if more schools join such initiatives, it will revolutionise the education sector, said government teacher Gargi Sharma.